Grammy Award Winning recording artist Redd Volkaert is a big fan of O.C. Duff Pickups and uses them in his main Tele's. 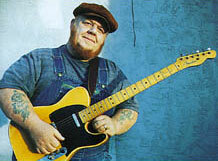 Redd uses the Plank'ster Tele Bridge and the Big Boy Tele neck pickup in his favorite Telecasters. O.C. Duff Pickups is a true custom shop for your handwound pickups needs. I use the highest quality, USA, vintage style components available. Every pickup is handmade and handwound, to order. Although it is very labor intensive, it is my commitment to high tonal quality, as well as to the customer who wants the best, that keeps me handwinding. Ask the other "boutique" pickup makers if they wind by machine or by hand - the answer may surprise you - and then compare their prices to mine. Please feel free to email me with the sound you are looking for, and we'll come up with something that knocks your socks off - and if the pickups don't, we'll try again until we get it right! Have a question? You can email us at oc@ocduffpickups.com, or check out our FAQ section. Email us for our mailing address.